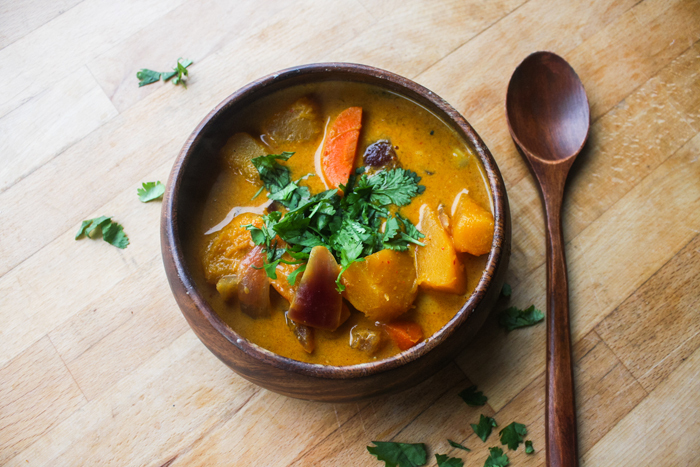 Curry is something that's made so artfully in other cultures, that I almost didn't want to list the ingredient "curry powder" in this recipe. 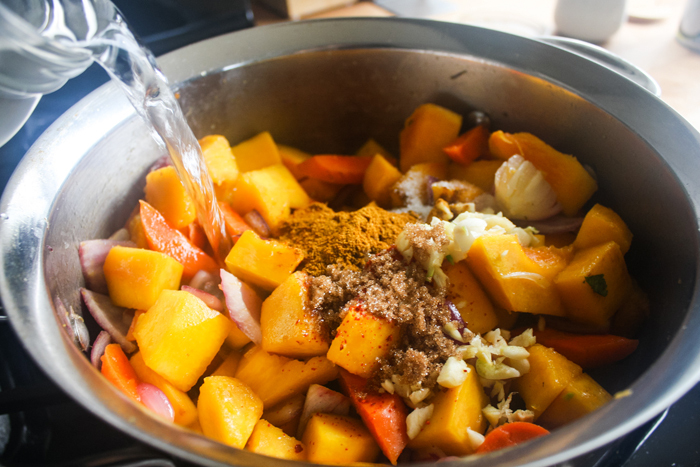 But if you see the combined spices of tumeric, coriander, cumin, ginger, fenugreek, cayenne, cinnamon, cardamom, cloves and nutmeg in your curry powder ... you'll be just fine. Luckily, curry powder is pretty common in grocery stores and the convenience of all the combined spices in a little container is a treat. So enjoy this stick-to-your-ribs meal and have a very happy Halloween! 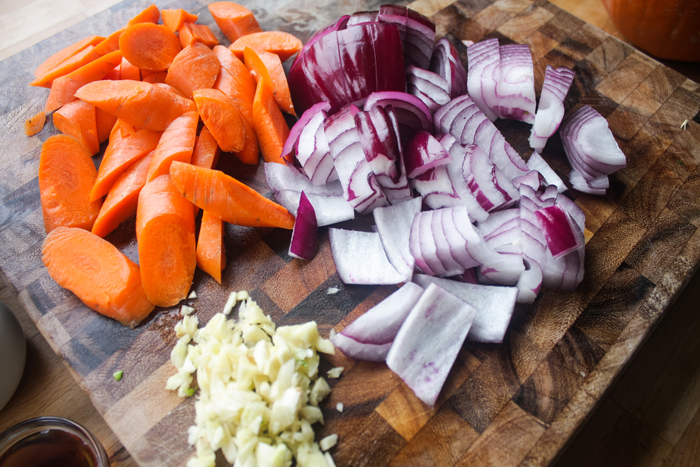 Chop the carrots and onions to about 1” pieces. Roughly mince the garlic cloves. Put a clean dish towel underneath the pumpkin laying on it’s side. Using a back and forth motion with your knife, cut the top and bottom off. Flip the pumpkin to one of the cut sides and put the dish towel under that. 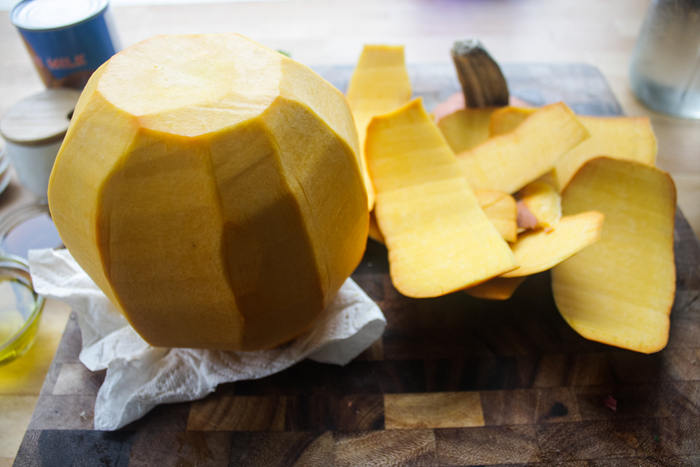 Starting from the top to bottom, cut off the skin of the pumpkin, rotating one piece at a time. 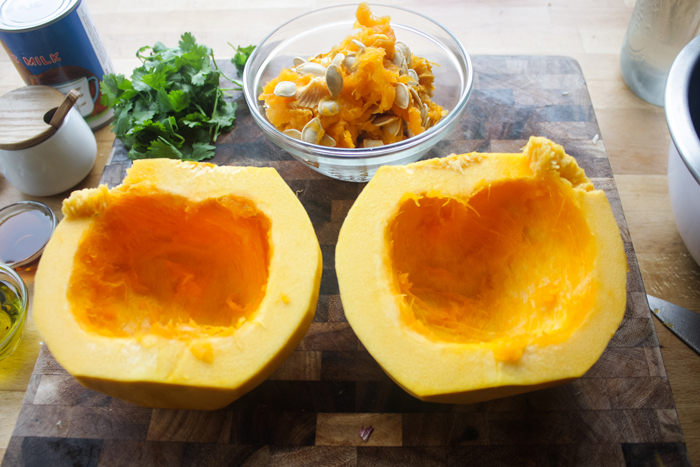 Cut the pumpkin in half and remove all of the pulp and seeds. Cut into ½” cubes. 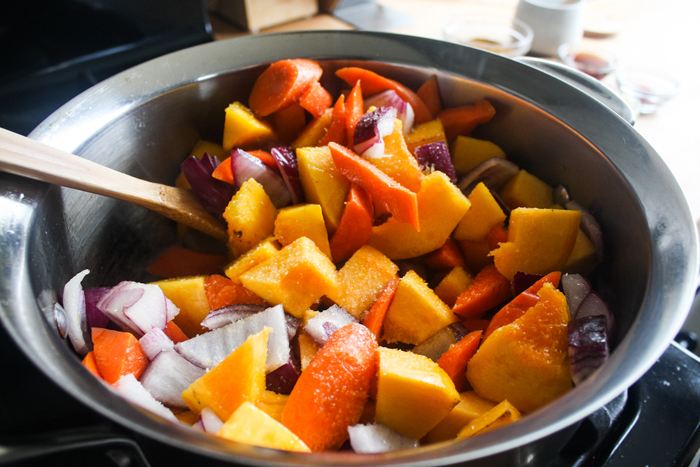 In a medium-high heat pot, add vegetable oil and starting browning the pumpkin, red onion and carrots for about 10 minutes, stirring occasionally. Once the vegetables get slightly tender, add in the garlic, gochugaru, fish sauce, brown sugar, salt and curry powder. 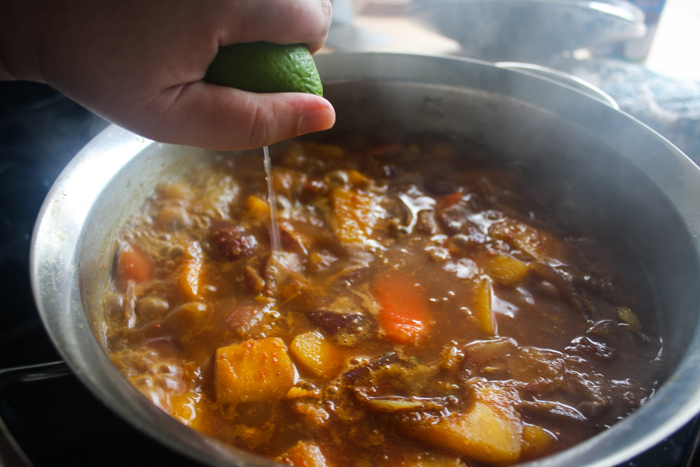 Add in the water, covering the vegetables about ½“. Stir everything together, then keep at a low boil for about 20 minutes. 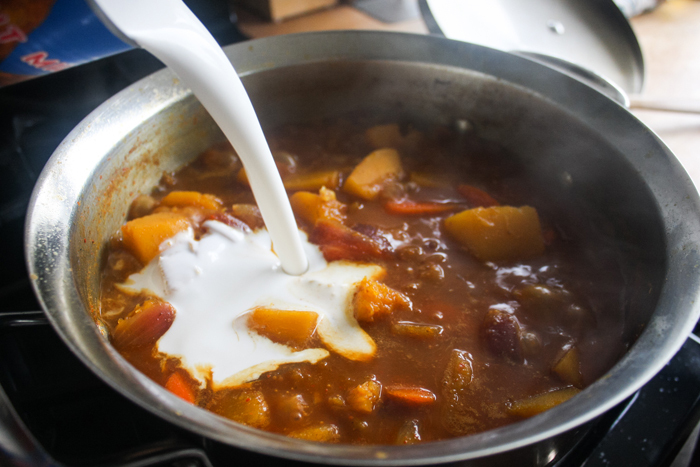 Once the vegetables are tender turn the heat to medium-low, then squeeze in the lime juice and add the coconut milk. Stir and keep on the heat until you see bubbles starting to form, showing the curry is heated through with the curry milk. Remove from heat and serve with steamed rice and top with cilantro. - Cutting a pumpkin can be very dangerous if your knife slips. Pay attention to slippery surfaces and be confident with your knife. The sharper your knife the better. - Omit the fish sauce to make this vegan, or try this vegan fish sauce substitute from The Kitchn.